Auto-Redirecting is the technique of automatically sending surfers to a different page. Usually, the browser receives a page which contains the code to automatically load a different page. It is possible for the page to be switched at the server so that the browser receives only one page, but auto-redirecting usually means receiving a page which automatically moves the surfer on to a different page. 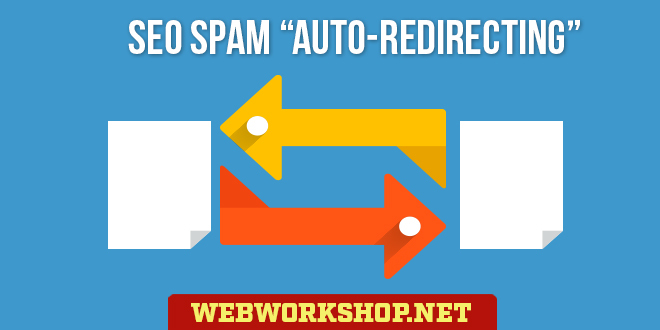 There are many valid reasons for auto-redirecting, such as redirecting people to browser-specific page versions, and redirecting people when a domain has moved. The search engines are not generally against the technique as long as the reason for it is valid and surfers are not mis-directed after clicking on a link in their search results. In fact, the engines auto-redirect people all the time. Have you ever tried going to http://www.aj.com/or http://www.av.com/? You won’t get to either of those domains. Actually you will get to them, but you will be quickly redirected to ask.com (AskJeeves) and altavista.com respectively. Or, if you are in an area of the world where there are local versions of those engines, you will be redirected to the local version (see Cloaking for IP delivery). So why are some people dead against auto-redirecting? If the engines do it, then surely it is ok for the rest of us to do it. Yes it is! The method can be used unscrupulously where a person clicks on a link in the search results, they go to the actual page, but the page immediately redirects them to a page on an entirely different topic. The surfer ends up at a place where s/he had no intention of going. That’s wrong, and it’s a very good reason to be against misuses of the auto-redirect method, but it is no reason at all to be against redirects in general. And yet some people are against auto-redirecting just because it doesn’t seem right. They think that, if a person clicks on a link to a page, then it is morally wrong if the person doesn’t end up at that specific page. They don’t seem to realize that the person who clicks the link, doesn’t click to go to a specific web page; they probably don’t even notice what the page is called. They click on a link to go to what the link text tells them is at the other end. They are not the least bit concerned if they get there via an intermediary page, as long as they get there, and get there quickly – and that’s important. People want to get to the other end quickly! They don’t want delays along the way. They don’t want to be stopped half-way there and asked to read some text, only to discover that they have to click again to get to where they have already clicked to go to. They’ve already chosen to go there; they don’t want to be made to choose again along the way. They really don’t want that. Altavista doesn’t think that they want it when people type “av.com” into the browser address box, and so Altavista sends them to their destination immediately – without delay. That’s the way it should be. This tag, which should be placed in the HEAD section of the redirecting page, tells the browser to refresh the page by loading the stated URL. The “5” tells the browser to do it 5 seconds after loading. Nobody is against this method as long as the number of seconds delay is sufficient for the surfer to see the page and to be able to read some of it. A typical use is after posting a message in a forum where the poster is given a confirmation page that, after a few seconds, automatically returns to the forum. However, some people question this method when the delay is set to 0 (immediate) or a tiny number of seconds. I have shown that there is nothing whatsoever wrong with an immediate redirect. I have shown that search engines are happy to do it, and I have shown that people want to go to what the link text tells them is at the other end – without any delays. There are valid reasons to set the delay to 0. Setting it higher than 0 and delaying the surfer en-route, for the sake of making some silly people happy, is just plain stupid. where url is the full or relative URL of the page to redirect to. In this case, the redirecting page is not retained in the browser’s History, and the Back button goes to the page before the redirecting page, thereby avoiding that awful trap where clicking the Back button takes you back to a redirecting page, which immediately redirects you forward again to the page you want to leave. The above is a typical example of an immediate redirect to the specified URL. If the script is placed in the HEAD section at the top of the page, the redirection occurs straight away, otherwise it may take a short time for the page to render before the browser even realizes that the script exists. I have demonstrated that there is nothing wrong or unethical with the auto-redirecting method as used in search engine optimization, provided that the final destination contains what the surfer expected to see. But the main cause of complaint about the method is when an auto-redirecting doorway page is listed in the search engine results. That’s what I’ll come to next.